Pre-Registration for the event is now CLOSED! We will be trialing a new and improved “Real Time Registration” through MX Communicator. It is basically like a “Mobile Kiosk”, so you still need your current AMA membership, and transponder number.This application would allow you to register at the track directly from your smart phone!!! How awesome would that be? Please be advised that this is a trial period and your feedback is important to us on the CTMX team as well as the web developers. You will still need to head to registration to sign waivers and collect practice/race stickers. Click here to pre-register for the event! Campsites include water and electric. Free septic dumping station available on departure. Please note that you will need current AMA membership for ALL events this race weekend. Can be purchased at the track if you have not done it online already. Must have proof of purchase/renewal if done online/or at different track prior to race event. There are no special activities planned for thursday! NO PIT RIDING AT ALL! Rocky Mountain ATV is proud to partner with the Chillitown MX for its 2018 racing season. You will get one $10 gift card for each race date when you enter at least 1 class. Its only one $10 gift card per race date, not per class. And you will continue to receive these $10 gift cards from Rocky Mountain ATV/MC for every CTMX race that you enter. 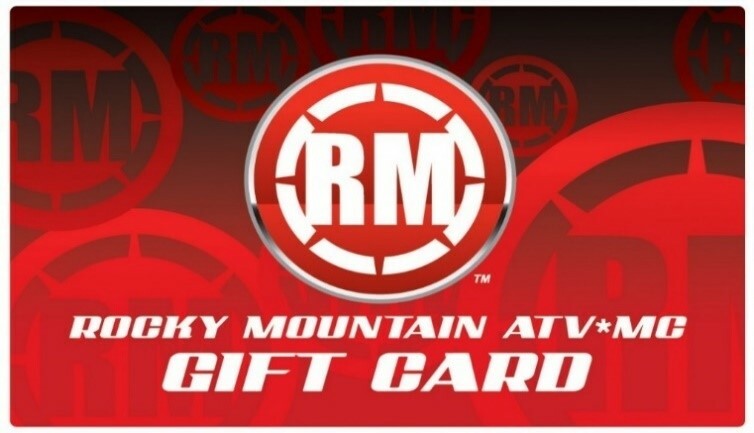 Click on the Rocky Mountain ATV/MC logo or the gift card for more details.